Children's Book Review :: Pumpkins, Pumpkins, Everywhere! 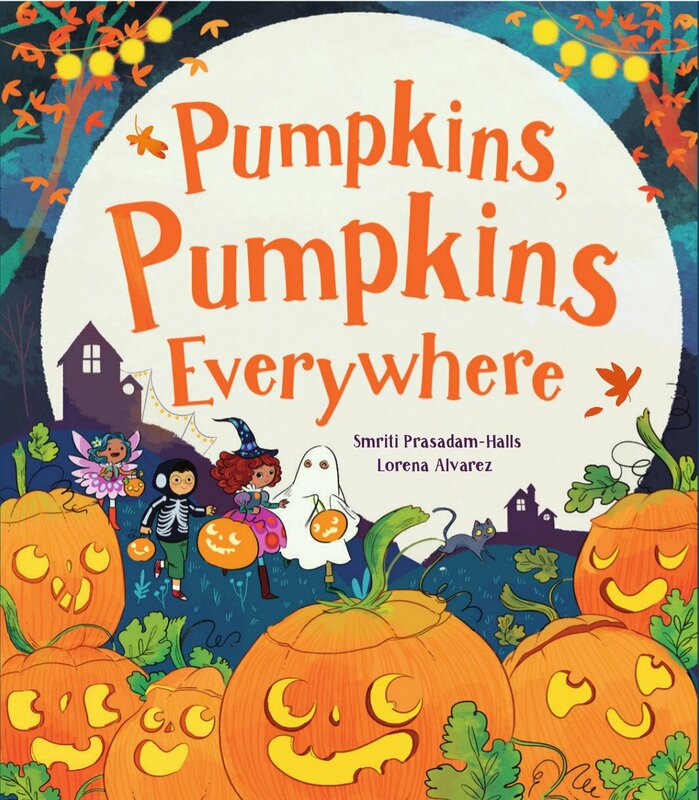 I must say that I've very rarely seen Halloween-themed pictures books so I was really interested when the girls received Pumpkins, Pumpkins, Everywhere! which is written by Smriti Prasadam-Halls and illustrated by Lorena Alvarez. Lara and Holly have a bedtime story every night and we always like to tie it in withe the seasons, where possible. Pumpkins, Pumpkins Everywhere is a picture book which follows a set of young trick-or-treaters as they make their way to the pumpkin parade. Each page features carved pumpkins of different sizes that the girls enjoyed spotting. To be honest, there isn't much of a story to the book but it does make a good first reading book with simple sentences such as "pumpkin happy" or "pumpkin sad" and it allows you to sit with your child and look for the pumpkin that the text refers to. Towards the pumpkin parade at the end, the story gets a little more adventurous but in general, I'd describe this as a picture book rather than a story. The illustrations are fun with lots of darks to contrast with the bright orange of the pumpkins but I don't think the pictures are enough to keep the girls interested in the story. I'm not sure this is a book that Lara and Holly would choose to go back to at any time of year other than at Halloween itself.